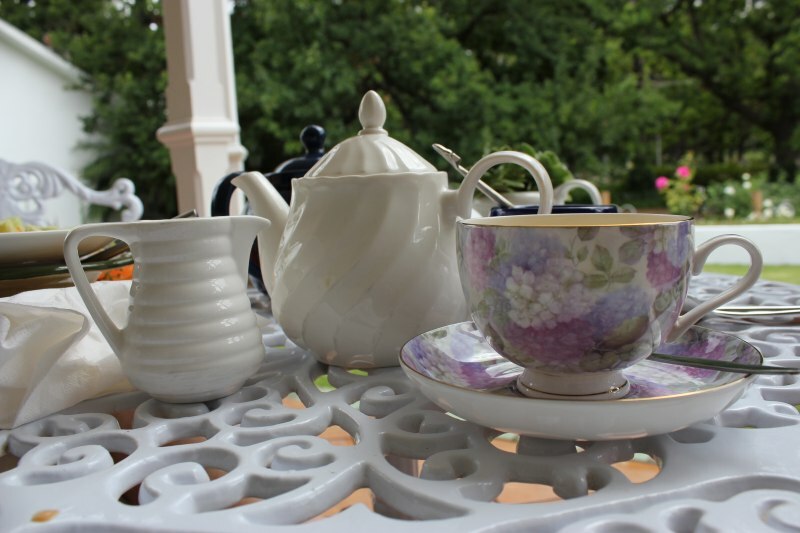 If you are looking for a spot that feels more like you’ve been invited to tea in colonial style at someone’s home (because that’s what it is) than having dropped in at a local coffee shop or bistro, then head to Tea under the Trees in Paarl. 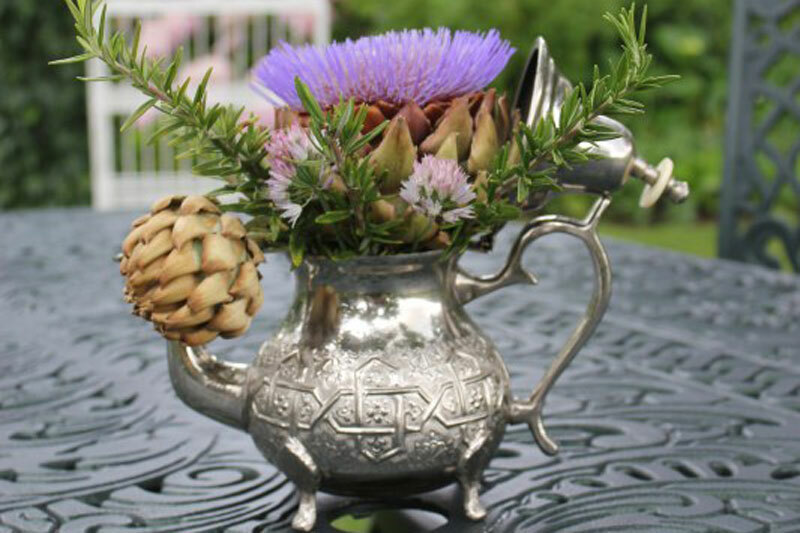 Just make sure you do it before autumn, as Debbie Redelinghuys only welcomes guests onto her period home veranda and inspired garden during the months of summer. Our visit to Paarl was on a particularly unusual summer’s day – with intermittent rain between bursts of sunshine – unusual for the Cape where winter rain is the standard. Our boot is filled with various seedlings and herbs as we’ve made the trip mainly to visit St Omer Farm where there is a wholesale nursery, which promised a coffee shop that didn’t materialise, despite the chalk board claiming the contrary. Our disappointment at not being able to experience another little coffee shop ‘find’ was staved, however, by the discovery of a type of colour plant we’d never even heard of. Celosias are reminiscent of ice-cream cones and waxy to the touch. These pretty and brightly coloured – pink, yellow, red and orange – flowers are a delight and look pretty hardy. Pity they didn’t survive the blistering heat of Cape Town during the last couple of weeks (should have got them into the ground a lot sooner!). Back in the car, we haul out a pamphlet on Paarl and decide to head up along its main road to see if any of the coffee shops there look appealing. We pass Tea under the Trees not much later, its driveway lined with oak trees, a quick glance sideways at the blackboard at our end of the drive advertising tea appeals more than just a little and necessitates a quick u-turn – but who’s looking? 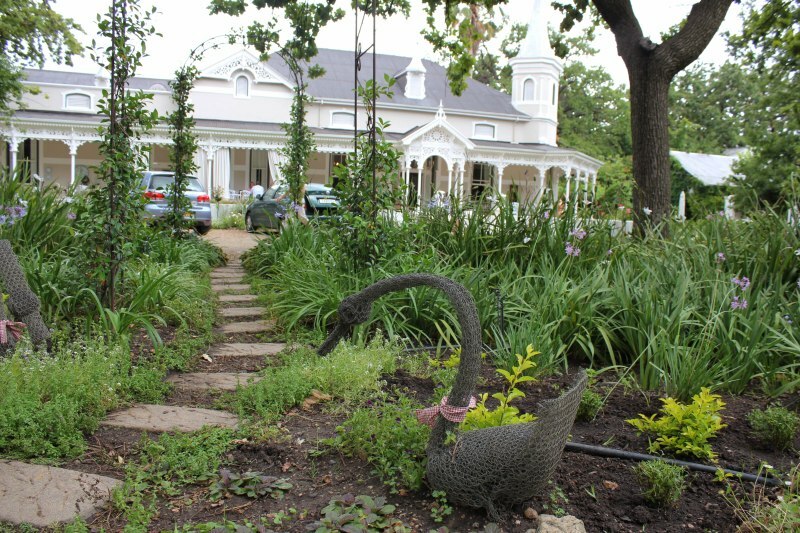 Tea under the Trees is set in a period home on Main Road, the R45 through Paarl. I find out after a few surreptitious questions that it is actually a farm known as St Pieter’s Roche. They grow grapes here, organic grapes, as I soon discover. And as luck would have it, we manage to make it to tea on one of the maybe four days of the year when Debbie Redelingshuys has a few boxes of said grapes for sale from her establishment – the rest of the grapes are for the export market, so we don’t even get a whiff of them in the local supermarkets. 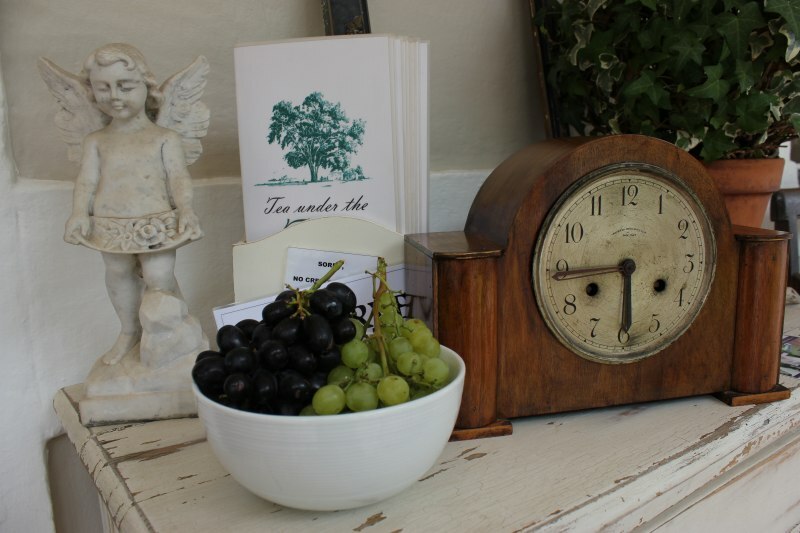 As we’re arranging ourselves at one of the tables in the midst of the garden, determined to ignore the rain, despite the rather uncomfortable wind, I notice a steady stream of locals arriving in their cars to pick up a couple of boxes each of grapes – the word is out. One glance at the house and I’m in love. The house and the oaks (there is a veritable forest of them in the garden in which we sit) have been here since the turn of the century, Debbie tells me. Her husband’s grandfather had the flat-pack version of the house sent over from Britain, and it was erected as we see it today. Granted, it’s obviously been looked after by the subsequent generations, but a peak inside reveals a long narrow wooden hallway filled with sunlight from each of the adjoining rooms. At the back I hear the sound of the kitchen from which light lunches and a feast of cake and tea is served on a daily basis during summer. We take a walk through the gardens. To our right are a series of grape vineyards, but most of the vines from which the sumptuous Sweet Surrender variety we have just sampled in little bowls on our table lie behind the house. 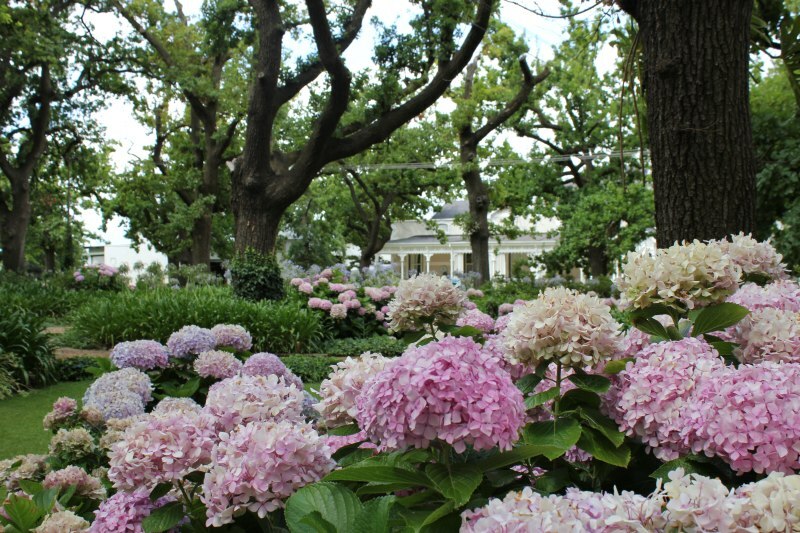 Surrounding us are too many oak trees to count, their bases planted thick with pink, white and maeve hydrangeas, their ample yet dainty heads filled with fresh petals, the grass kept in mint condition and perfect for just under your feet. The quintessential English country garden lies at our feet. There is a beautiful wooden seat swing, the ropes of which are swung over a branch way, way above us, making the radius of the swing a thrill to even big children. All over the garden there are little ‘spots’ with benches, wrought iron bird’s cages, even a candelabra, suspended from the branches of the oaks. We’re forced onto the veranda of the home within minutes as the rain begins once again. My vanilla scented camomile arrives in a beautiful teapot and cup and saucer, and my tuna salad has been made with care. Actually I could have been served virtually anything, to be honest, and it would have tasted delicious simply because of the beauty of my surrounds, but the food is good. Word has it that some of the very best carrot cake is to be had here, although this time around I do not sample. To one side of the house, Debbie has converted a garage into a Vintage Shop filled with bric ‘n brac and antique type fillers for your home. Aside from the obvious advantages of having tea here, you can also arrange small functions and photo shoots, in-between scoffing the carrot cake. I watch a truck head up along the other side of the vines. Reliance Compost operates from the back side of the farm, begun as a necessity to provide compost for the organic export table grapes the farm grows. But tea drinkers can take advantage whilst they’re here too, and pick up the odd rather big bucket of ‘If Plants could Talk’ Reliance fertilisers, plant and vegetable conditioners and compost. The arrival of one of Debbie’s school going daughters up the driveway, muttering about her mother’s inaccessibility via cell phone, brings us back to reality. Whilst Debbie hares off to find her daughter’s missing art file, left on the bus, we re-group, manage to buy the last couple of boxes of grapes, take a longing look around at the beautiful garden, and head back to Cape Town via the Paarl Mountain Nature Reserve, a wonderful drive up above the town.